Australia, 2013, 90 minutes, Colour. Marie Bunel, Daniel, Bryan Brown, Julia Zemira. 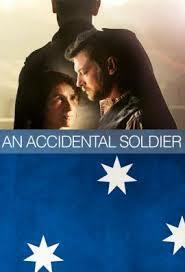 An Accidental Soldier is based on an acclaimed novel by author. It is a memoir of an Australian soldier, a baker who volunteered for military service, was a cook and a baker but, with the need for men on the front line, was moved there and was wounded. He wandered the French countryside rather than immediately returning to the war. He found shelter with a French woman who worked in a munitions factory, hid him, fed him, gave him her deceased son’s clothes. He experienced love and affection, was a virgin and consummated love with the woman. It was genuine love because at the end of the war, when he escaped the firing squad because of Australian government policy about executions of deserters, he returned to the house, rebuilt it while she served a sentence for espionage because of her husband from Alsace. Marie Bunel is very effective and credible as the French woman. Daniel, who has appeared in a number of Australian television series, also makes Harry Lambert quite credible. TV personality Julia Zemira appears as a mother working in the munitions factory. Bryan Brown is the military officer dealing with Harry. The film was directed by Rachel Ward, who had directed a number of short films as well as the feature, Beautiful Kate. 1. All the memories of world war one? Australians in Europe? In France? Their experiences? 2. The heroism and battles off-screen, lightning explosion flashes in the distance? The wounded, the deserters, the French gendarmes and their inquiries? British deserters, Australians, the statistics given at the end? Execution for British and new Zealanders, not for Australians? 3. The title, Harry as a Baker, shutter written on the wall? His enlisting, baking, on the front line, the need for men, the casualties and the death of his young associate? If the military attitude towards decision? The French police? The arrests? Espionage issues? 4. The opening and the posters, the war recruitment posters? 1918? 5. The setting, the village, filmed in Western Australia? The construction of the farm, the buildings in the village, the streets, the munitions factory, the woods? The echoes of the Australian Town with the Baker, the people, hostility towards shirkers, Harris home? 6. Harry Lambert, his age, his work as a banker, living with his mother, her trying to persuade him not to go, his reaction to the accusation of chauffeur, the village gossip? Not married, virgin? Going to war? 7. His being wounded, wandering, thinking, deciding, remembering and the flashbacks? His mother and her attitude towards his going? The Bacri and his work? In the war? The young friend, the explosion, the deaths? 8. His meeting, lawn, her age, her husband, from Alsace, speaking German, her son’s death? Her being wary of Harry? It welcoming him, hiding him, beating him, giving him her sons clothes? Work and the munitions factory, on the line, Isabelle and her talk, her son and his observing, attitude towards Harry? The declarations against war? The hiding Harry, the gendarmes following, her cat, come in so? 9. The issues of language, Harry and his English, Connolly and her French? His knowing some words, expressing his gratitude? Calls reaction, his staying, the clothes, urging him to leave, his being trapped in the woods and return, the affection, the expressions of love, the effect, his bathing in the pond, the thieves and the house, her sons photo, her reprimand? His making the grade? Staying, life of the farm, the sequence with the bases? 10. Isabelle and her son, at work, promoting the wall her wanting a promotion, the young girls speaking out, the reaction of the bosses? Her visits for the kids? 11. The gendarmes, their searches, sink along as a spy, because of her husband, the letters? Her speaking her reading Jim? 12. Harry, his arrest, in the cells, the officer, their discussions, the issue of espionage, the dangers for coal on? His learning French, writing on the wall, letters to come on, the officer helping him with pen and paper? : Receiving them and putting them under the pillow? 13. Column, her arrest, the sentence, interrogations, prison, her work, the nuns, Harry come to visit, her not wanting to see him, the talking? 14. The inn of the war, the firing squad for visitors, Harry getting a reprieve? The military man and his sympathies? Harry unbending in his defense of coal? 15. Freedom, the years passing, love, rebuilding the house, Cobb and her return? 16. The film as a war story, as portrait of individuals of different cultures, a love story? From the perspective of the 21st century?